Usually, the most tedious aspect or setting up a new office or renovating an old one is designing its interior. In the corporate sector, your interior space may define you. It shows what your brand is all about. So, you have to make it feel warm and appear cozy. It should also be inspiring since the office is a place where ideas translate to practical results. There are a few factors that come into play if you want to end up with an exquisite interior design. They include space, furniture, color, and light. 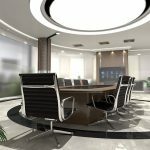 You have to think of creative ways to play with these factors if you are looking for the best corporate interior design. Proper organization is key when it comes to creating more office space. For example, you may find it economical to create storage drawers instead of open shelves. You can use the drawers to store files and other office supplies. You also need to partition your floor space properly so as to create enough room for each department. The global corporate furniture sector is fast-paced. Therefore, you need to buy the latest designs to fit in your offices. Other than being stylish, the furniture should be comfortable and customized to suit your office space. From the cabinets to the conference chairs, go for designs that represent your identity, needs, and preferences. Unlike a home interior, you don’t have to be colorful when designing a corporate interior space. Your choice of color needs to be sober and great options to consider are blue, white, and red. In this case, blue represents calmness, white shows cleanliness, and red demonstrates energy. It’s not about using bright colors here. It’s about exploiting the power of light. Normally, well-lit office space is more inspiring than a dull one. It improves the mood and incites you to be more productive. You need to invest in spacious windows and supplement the natural light with LED fixtures. Why natural light? Well, bright natural light will make your employees and visitors cheerful and when you work around people with good moods, productivity is bound to increase. It takes creative corporate interior design ideas like ones discussed to change an ordinary office space into an inspiring and productive one. So, if you were planning to move to a new space this year, you’ll have to invest more in interior design. This will be for the benefit of all office users.